It’s hard to imagine politicians in Washington making the same deal for this land if it were considered sacred and holy by any other major religious group. But it’s sadly in keeping with a history of Native American mistreatment and dislocation. Foreign-owned mining giant Rio Tinto has repeatedly sought control of this copper-rich land over the past decade, lobbying Congress more than a dozen times since 2005.4 And it shouldn’t come as a surprise that Senators McCain and Flake were behind this unprecedented corporate giveaway. McCain has received campaign contributions from Rio Tinto subsidiaries for years, and Flake – before being elected to Congress – actually lobbied for a Rio Tinto subsidiary in support of a massive uranium mine in Namibia. We need to fight back against this deeply undemocratic move and show Washington that Americans won’t stand by as our legislative process is twisted and sold off to the highest bidder. 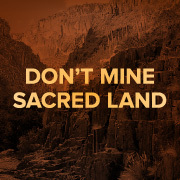 Sign the petition: Protect Native American holy land from mining. 1. Lydia Millet, “Selling Off Apache Holy Land,” The New York Times, May 29, 2015. 3. Zach Zorich, “Planned Arizona copper mine would put a hole in Apache archaeology,” Science, December 10, 2014. 4. Serene Fang, “In Arizona, a controversial federal land swap leaves Apaches in the lurch,” Al Jazeera America, February 20, 2015.